Although optional, the cherries in this recipe add a little extra color and flavor to these old-fashioned watermelon rind pickles. You do need to plan ahead with this recipe as the rinds have to soak overnight in the brine. Trim the dark green and pink parts from watermelon rind. Cut rind into 1-inch cubes and measure out 7 cups. Put the watermelon rind in a large container with the pickling salt and 3 cups water. Add more water to cover the rinds, if necessary. Soak overnight. Drain and rinse watermelon rind. Cover rind with cold water in a large saucepan. Cook just until tender - about 10 minutes. Meanwhile, in a nonreactive 6- to an 8-quart kettle or Dutch oven, combine sugar, vinegar, cinnamon, whole cloves, and 1 cup water. Simmer the mixture 10 minutes. Then pour the liquid back into the pan. Add drained watermelon rind, lemon slices, and maraschino cherries, if using. Simmer the mixture until watermelon rind is translucent, about 30 minutes. Fill hot half-pint jars with watermelon rind and syrup mixture, leaving 1/2-inch headspace. Adjust lids. Let jars cool on a rack. 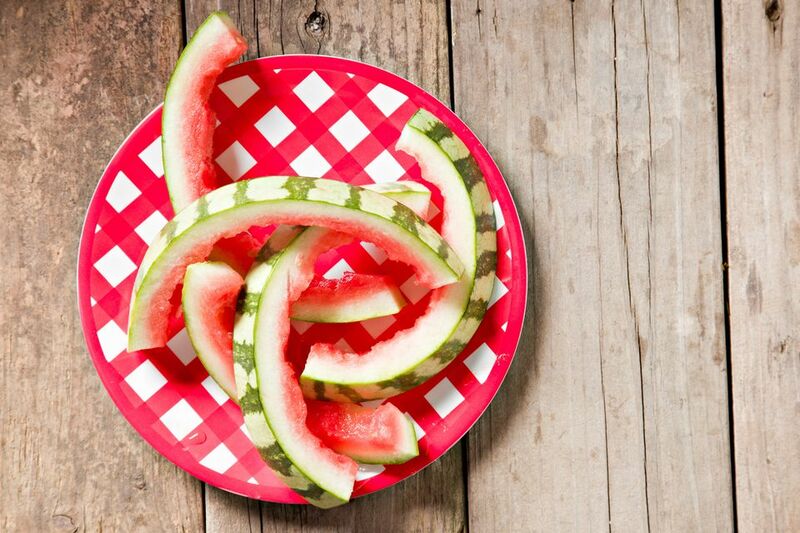 We know that watermelon is the ideal refreshment on a hot summer day, but did you know that the watermelon rind is the healthiest part of the fruit? Packed with vitamins and minerals, the rind offers lots of nutrients such as Vitamin C, Vitamin B6, and Vitamin A, as well as potassium and magnesium. It is also very beneficial if you are pregnant, as its natural sugars have been shown to alleviate morning sickness and dehydration. The rind can also reduce swelling as well as heartburn, common ailments during the nine months. In addition, the amino acids in the rind help to relax the blood vessels, reducing muscle cramps which are common in the third trimester. So, if you are expecting, this recipe for old-fashioned watermelon rind pickles is ideal to have on hand to enjoy once in a while.